THE BEST RETRO MUSIC FROM THE 70s, 80s, 90s and 00s! 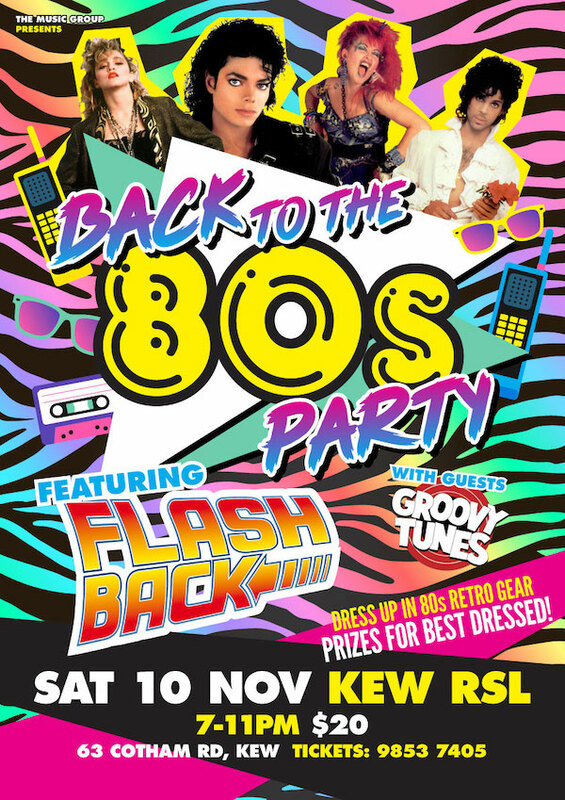 Break out the leg-warmers, big hair and acid wash jeans as Melbourne’s most popular Retro Cover Band FLASHBACK are here to revive the best music of the 70s, 80s and 90s! FLASHBACK are a dynamic hi-energy live cover band delivering classic hits from 3 fabulous decades of timeless music, from bands such as Earth, Wind & Fire, ABBA, Michael Jackson, Bananarama, Duran Duran, Blondie, ACDC, U2, Madonna, Wham, Bon Jovi, Fleetwood Mac, Cold Chisel, Tina Turner and many more. It’s a feast of the most popular pop and rock songs of all time. COME SEE US AT THE KEW RSL SATURDAY NOV 10th 2018 FOR THE ULTIMATE 80s NIGHT! FLASHBACK has become one of Melbourne’s most popular bands, and a leading choice for event planners around Australia and Asia for corporate events, awards ceremonies, gala balls, sporting events, private parties and festivals. Catch Flashback soon – they are SIMPLY THE BEST! FLASHBACK are available for hire for corporate events, festivals, parties and even weddings! Copyright © 2019 Flashback Cover Band.